"I've had this recipe since 7th grade. 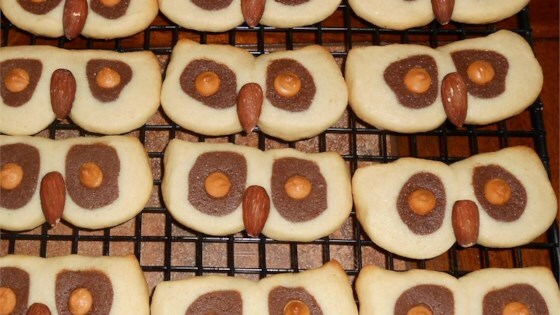 They look like an owls' face and they come out tasty and cute!" Cream butter and sugar until fluffy. Beat in egg and vanilla. Add baking powder and salt. Beat well. Add flour and mix until blended. Remove 2/3 of dough. Roll or pat dough out to form two 10 x 4 inch rectangles. Add cocoa to remaining 1/3 of dough. Mix until blended. Shape chocolate dough into two 10 inch long rolls. Place on rectangle and roll plain dough to cover chocolate dough completely, not including ends. Wrap in plastic wrap and chill at least 2 hours. Cut dough into 1/8 inch slices with a sharp knife. Place two slices side by side on a cookie sheet to resemble an owl's face. Pinch upper "corners" to resemble ears. Put chocolate chips in each dark circle for eyes and a cashew in the center for the beak. Bake for 8 to 12 minutes in the preheated oven, or until lightly browned. This recipe works so much better using m&m's for the eyes instead of chocolate chips. Try it! A perfect little cookie for halloween parties.